"Wry neck" redirects here. For the bird, see Wryneck. Torticollis, also known as wry neck, is a dystonic condition defined by an abnormal, asymmetrical head or neck position, which may be due to a variety of causes. The term torticollis is derived from the Latin words tortus for twisted and collum for neck. The most common case has no obvious cause, and the pain and difficulty with turning the head usually goes away after a few days, even without treatment. Torticollis is a fixed or dynamic tilt, rotation, with flexion or extension of the head and/or neck. The type of torticollis can be described depending on the positions of the head and neck. A combination of these movements may often be observed. Torticollis can be a disorder in itself as well as a symptom in other conditions. A multitude of conditions may lead to the development of torticollis including: muscular fibrosis, congenital spine abnormalities, or toxic or traumatic brain injury. A rough categorization discerns between congenital torticollis and acquired torticollis. The congenital muscular torticollis is the most common torticollis which is present at birth. The cause of congenital muscular torticollis is unclear. Birth trauma or intrauterine malposition is considered to be the cause of damage to the sternocleidomastoid muscle in the neck. Other alterations to the muscle tissue arise from repetitive microtrauma within the womb or a sudden change in the calcium concentration in the body which causes a prolonged period of muscle contraction. Any of these mechanisms can result in a shortening or excessive contraction of the sternocleidomastoid muscle, which curtails its range of motion in both rotation and lateral bending. The head typically is tilted in lateral bending toward the affected muscle and rotated toward the opposite side. In other words, the head itself is tilted in the direction towards the shortened muscle with the chin tilted in the opposite direction. Congenital Torticollis is presented at 1–4 weeks of age, and a hard mass usually develops. It is normally diagnosed using ultrasonography and a colour histogram or clinically through evaluating the infant's passive cervical range of motion. Congenital torticollis constitutes the majority of cases seen in clinical practice. The reported incidence of congenital torticollis is 0.3-2.0%. Sometimes a mass, such as a sternocleidomastoid tumor, is noted in the affected muscle at the age of two to four weeks. Gradually it disappears, usually by the age of eight months, but the muscle is left fibrotic. Noncongenital muscular torticollis may result from scarring or disease of cervical vertebrae, adenitis, tonsillitis, rheumatism, enlarged cervical glands, retropharyngeal abscess, or cerebellar tumors. It may be spasmodic (clonic) or permanent (tonic). The latter type may be due to Pott's Disease (tuberculosis of the spine). A self-limiting spontaneously occurring form of torticollis with one or more painful neck muscles is by far the most common ('stiff neck') and will pass spontaneously in 1–4 weeks. Usually the sternocleidomastoid muscle or the trapezius muscle is involved. Sometimes draughts, colds, or unusual postures are implicated; however in many cases no clear cause is found. These episodes are commonly seen by physicians. Tumors of the skull base (posterior fossa tumors) can compress the nerve supply to the neck and cause torticollis, and these problems must be treated surgically. Infections in the posterior pharynx can irritate the nerves supplying the neck muscles and cause torticollis, and these infections may be treated with antibiotics if they are not too severe, but could require surgical debridement in intractable cases. Ear infections and surgical removal of the adenoids can cause an entity known as Grisel's syndrome, a subluxation of the upper cervical joints, mostly the atlantoaxial joint, due to inflammatory laxity of the ligaments caused by an infection. There are many other rare causes of torticollis. A very rare cause of acquired torticollis is fibrodysplasia ossificans progressiva (FOP), the hallmark of which is malformed great toes. Torticollis with recurrent, but transient contraction of the muscles of the neck and especially of the sternocleidomastoid, is called spasmodic torticollis. Synonyms are "intermittent torticollis", "cervical dystonia" or "idiopathic cervical dystonia", depending on cause. Torticollis may be unrelated to the sternocleidomastoid muscle, instead caused by damage to the trochlear nerve (fourth cranial nerve), which supplies the superior oblique muscle of the eye. The superior oblique muscle is involved in depression, abduction, and intorsion of the eye. When the trochlear nerve is damaged, the eye is extorted because the superior oblique is not functioning. The affected person will have vision problems unless they turn their head away from the side that is affected, causing intorsion of the eye and balancing out the extorsion of the eye. This can be diagnosed by the Bielschowsky test, also called the head-tilt test, where the head is turned to the affected side. A positive test occurs when the affected eye elevates, seeming to float up. The underlying anatomical distortion causing torticollis is a shortened sternocleidomastoid muscle. This is the muscle of the neck that originates at the sternum and clavicle and inserts on the mastoid process of the temporal bone on the same side. There are two sternocleidomastoid muscles in the human body and when they both contract, the neck is flexed. The main blood supply for these muscles come from the occipital artery, superior thyroid artery, transverse scapular artery and transverse cervical artery. The main innervation to these muscles is from cranial nerve XI (the accessory nerve) but the second, third and fourth cervical nerves are also involved. Pathologies in these blood and nerve supplies can lead to torticollis. Evaluation of a child with torticollis begins with history taking to determine circumstances surrounding birth and any possibility of trauma or associated symptoms. Physical examination reveals decreased rotation and bending to the side opposite from the affected muscle. Some[who?] say that congenital cases more often involve the right side, but there is not complete agreement about this in published studies. Evaluation should include a thorough neurologic examination, and the possibility of associated conditions such as developmental dysplasia of the hip and clubfoot should be examined. Radiographs of the cervical spine should be obtained to rule out obvious bony abnormality, and MRI should be considered if there is concern about structural problems or other conditions. Ultrasonography can be used to visualize muscle tissue, with a colour histogram generated to determine cross-sectional area and thickness of the muscle. Evaluation by an optometrist or an ophthalmologist should be considered in children to ensure that the torticollis is not caused by vision problems (IV cranial nerve palsy, nystagmus-associated "null position," etc.). Cervical dystonia appearing in adulthood has been believed to be idiopathic in nature, as specific imaging techniques most often find no specific cause. Initially, the condition is treated with physical therapies, such as stretching to release tightness, strengthening exercises to improve muscular balance, and handling to stimulate symmetry. A TOT collar is sometimes applied. Early initiation of treatment is very important for full recovery and to decrease chance of relapse. Physical therapy is an option for treating torticollis in a non-invasive and cost-effective manner. While outpatient infant physiotherapy is effective, home therapy performed by a parent or guardian is just as effective in reversing the effects of congenital torticollis. It is important for physical therapists to educate parents on the importance of their role in treatment and to create a home treatment plan together with them for the best results for their child. Five components have been recognized as the "first choice intervention" in PT for treatment of torticollis and include neck passive range of motion, neck and trunk active range of motion, development of symmetrical movement, environmental adaptations, and caregiver education. In therapy, parents or guardians should expect their child to be provided with these important components, explained in detail below. Lateral neck flexion and overall range of motion can be regained quicker in newborns when parents conduct physical therapy exercises several times a day. Stretching the neck and trunk muscles actively. Parents can help promote this stretching at home with infant positioning. For example, prone positioning will encourage the child to lift their chin off the ground, thereby strengthening their bilateral neck and spine extensor muscles, and stretching their neck flexor muscles. Active rotation exercises in supine, sitting or prone position by using toys, lights and sounds to attract infant's attention to turn neck and look toward the non-affected side. Stretching the muscle in a prone position passively. Passive stretching is manual, and does not include infant involvement. Two people can be involved in these stretches, one person stabilizing the infant while the other holds the head and slowly brings it through the available range of motion. Passive stretching should not be painful to the child, and should be stopped if the child resists. Also, discontinue the stretch if changes in breathing or circulation are seen or felt. Stretching the muscle in a lateral position supported by a pillow (have infant lie on the side with the neck supported by pillow). Affected side should be against the pillow to deviate the neck towards the non-affected side. Encouraging prone playtime (tummy time). Although the Back to Sleep campaign promotes infants sleeping on their backs to avoid sudden infant death syndrome during sleep, parents should still ensure that their infants spend some waking hours on their stomachs. A Korean study has recently[when?] introduced an additional treatment called microcurrent therapy that may be effective in treating congenital torticollis. For this therapy to be effective the children should be under three months of age and have torticollis involving the entire sternocleidomastoid muscle with a palpable mass and a muscle thickness over 10 mm. Microcurrent therapy sends minute electrical signals into tissue to restore the normal frequencies in cells. Microcurrent therapy is completely painless and children can only feel the probe from the machine on their skin. Microcurrent therapy is thought to increase ATP and protein synthesis as well as enhance blood flow, reduce muscle spasms and decrease pain along with inflammation. It should be used in addition to regular stretching exercises and ultrasound diathermy. Ultrasound diathermy generates heat deep within body tissues to help with contractures, pain and muscle spasms as well as decrease inflammation. This combination of treatments shows remarkable outcomes in the duration of time children are kept in rehabilitation programs: Micocurrent therapy can cut the length of a rehabilitation program almost in half with a full recovery seen after 2.6 months. About 5–10% of cases fail to respond to stretching and require surgical release of the muscle. Surgical release involves the two heads of the sternocleidomastoid muscle being dissected free. This surgery can be minimally invasive and done laparoscopically. Usually surgery is performed on those who are over 12 months old. The surgery is for those who do not respond to physical therapy or botulinum toxin injection or have a very fibrotic sternocleidomastoid muscle. After surgery the child will be required to wear a soft neck collar (also called a Callot's cast). There will be an intense physiotherapy program for 3–4 months as well as strengthening exercises for the neck muscles. Studies and evidence from clinical practice show that 85–90% of cases of congenital torticollis are resolved with conservative treatment such as physical therapy. Earlier intervention is shown to be more effective and faster than later treatments. More than 98% of infants with torticollis treated before 1 month of age recover by 2.5 months of age. Infants between 1 and 6 months usually require about 6 months of treatment. After that point, therapy will take closer to 9 months, and it is less likely that the torticollis will be fully resolved. It is possible that torticollis will resolve spontaneously, but chance of relapse is possible. For this reason, infants should be reassessed by their physical therapist or other provider 3–12 months after their symptoms have resolved. In veterinary literature usually only the lateral bend of head and neck is termed torticollis, whereas the analogon to the rotatory torticollis in humans is called a head tilt. The most frequently encountered form of torticollis in domestic pets is the head tilt, but occasionally a lateral bend of the head and neck to one side is encountered. ^ Not be confused with the genus Loxia covering those bird species known as "crossbills", which was assigned by Swiss naturalist Conrad Gesner because of the obvious similarities. ^ a b Dauer, W.; Burke, RE; Greene, P; Fahn, S (1998). "Current concepts on the clinical features, aetiology and management of idiopathic cervical dystonia". Brain. 121 (4): 547–60. doi:10.1093/brain/121.4.547. PMID 9577384. ^ a b c d Cooperman, Daniel R. (1997). Karmel-Ross, Karen, ed. The Differential Diagnosis of Torticollis in Children. Physical & Occupational Therapy in Pediatrics. 17. pp. 1–11. doi:10.1080/J006v17n02_01. ISBN 978-0-7890-0316-4. ^ Bartleson, J. D.; Deen, H. Gordon (2009-07-23). Spine Disorders: Medical and Surgical Management. Cambridge University Press. p. 46. ISBN 9780521889414. Many patients for no apparent reason will awaken in the morning with a “wry” neck or a “crick” in the neck. They may have trouble moving the neck and often have acute muscle spasm. Their pain and limited range of motion subside typically in a matter of a few days without or perhaps more quickly with treatment. ^ Velickovic, M; Benabou, R; Brin, MF (2001). "Cervical dystonia pathophysiology and treatment options". Drugs. 61 (13): 1921–43. doi:10.2165/00003495-200161130-00004. PMID 11708764. ^ "Cervical dystonia - Symptoms and causes - Mayo Clinic". www.mayoclinic.org. Retrieved 2017-11-02. ^ Papapetropoulos, S; Tuchman, A; Sengun, C; Russell, A; Mitsi, G; Singer, C (2008). "Anterocollis: Clinical features and treatment options". Medical Science Monitor. 14 (9): CR427–30. PMID 18758411. ^ Papapetropoulos, Spiridon; Baez, Sheila; Zitser, Jennifer; Sengun, Cenk; Singer, Carlos (2008). "Retrocollis: Classification, Clinical Phenotype, Treatment Outcomes and Risk Factors". European Neurology. 59 (1–2): 71–5. doi:10.1159/000109265. PMID 17917462. ^ a b Saxena, Amulya (2015). "Pediatric torticollis surgery treatment & management". Medscape. ^ "Torticollis: MedlinePlus Medical Encyclopedia". medlineplus.gov. ^ a b c d e f g h i Tomczak, K (2013). "Torticollis". Journal of Child Neurology. 28 (3): 365–378. doi:10.1177/0883073812469294. PMID 23271760. ^ 2013, Boston Childrens Hospital. "Torticollis | Boston Children's Hospital". www.childrenshospital.org. Retrieved 2017-09-21. ^ a b c d e Carenzio, G (2015). "Early rehabilitation treatment in newborns with congenital muscular torticollis". Phys Rehabil Med. ^ Boricean, ID (2011). "Understanding ocular torticollis in children". Oftalmologia (Bucharest, Romania : 1990). 55 (1): 10–26. PMID 21774381. ^ Cheng, JC; Wong, MW; Tang, SP; Chen, TM; Shum, SL; Wong, EM (2001). "Clinical determinants of the outcome of manual stretching in the treatment of congenital muscular torticollis in infants. A prospective study of eight hundred and twenty-one cases". The Journal of Bone and Joint Surgery. American Volume. 83-A (5): 679–87. doi:10.2106/00004623-200105000-00006. PMID 11379737. ^ Bocciolini, C; Dall’Olio, D; Cunsolo, E; Cavazzuti, PP; Laudadio, P (August 2005). "Grisel's syndrome: a rare complication following adenoidectomy". Acta Otorhinolaryngologica Italica. 25 (4): 245–249. ISSN 0392-100X. PMC 2639892. PMID 16482983. ^ Dressler, D.; Benecke, R. (2005). "Diagnosis and management of acute movement disorders". Journal of Neurology. 252 (11): 1299–306. doi:10.1007/s00415-005-0006-x. PMID 16208529. ^ "Trochlear Nerve Palsy: Background, History of the Procedure, Problem". 2016-08-12. ^ a b c d e Kwon, D.R. (2014). "Efficacy of micro current therapy in infants with congenital muscular torticollis involving the entire sternocleidomastoid muscle". Clinical Rehabillitation. ^ Crowner, Beth E. (2007-11-01). "Cervical Dystonia: Disease Profile and Clinical Management". Physical Therapy. 87 (11): 1511–1526. doi:10.2522/ptj.20060272. ISSN 0031-9023. PMID 17878433. ^ Kaplan, Sandra L.; Coulter, Colleen; Fetters, Linda (2013). "Physical Therapy Management of Congenital Muscular Torticollis". Pediatric Physical Therapy. 25 (4): 348–394. doi:10.1097/pep.0b013e3182a778d2. PMID 24076627. ^ a b c d e f g h i j k l m n o Kaplan, Sandra L.; Coulter, Colleen; Sargent, Barbara (October 2018). "Physical Therapy Management of Congenital Muscular Torticollis: A 2018 Evidence-Based Clinical Practice Guideline From the APTA Academy of Pediatric Physical Therapy". Pediatric Physical Therapy. 30 (4): 240–290. doi:10.1097/PEP.0000000000000544. ISSN 0898-5669. ^ Tang, SF; Hsu, KH; Wong, AM; Hsu, CC; Chang, CH (2002). "Longitudinal followup study of ultrasonography in congenital muscular torticollis". Clinical Orthopaedics and Related Research. 403 (403): 179–85. doi:10.1097/00003086-200210000-00026. PMID 12360024. ^ Hsu, Tsz-Ching; Wang, Chung-Li; Wong, May-Kuen; Hsu, Kuang-Hung; Tang, Fuk-Tan; Chen, Huan-Tang (1999). "Correlation of clinical and ultrasonographic features in congenital muscular torticollis". Archives of Physical Medicine and Rehabilitation. 80 (6): 637–41. doi:10.1016/S0003-9993(99)90165-X. PMID 10378488. ^ Seung, Seo (2015). "Change of facial asymmetry in patients". Medscape. ^ Samotus, Olivia; Lee, Jack; Jog, Mandar (2018-03-20). "Personalized botulinum toxin type A therapy for cervical dystonia based on kinematic guidance". Journal of Neurology. 265 (6): 1269–1278. doi:10.1007/s00415-018-8819-6. ISSN 1432-1459. PMID 29557988. ^ Safarpour, Yasaman; Jabbari, Bahman (2018-02-24). "Botulinum Toxin Treatment of Movement Disorders". Current Treatment Options in Neurology. 20 (2): 4. doi:10.1007/s11940-018-0488-3. ISSN 1092-8480. PMID 29478149. ^ Künzel, Frank; Joachim, Anja (2009). "Encephalitozoonosis in rabbits". Parasitology Research. 106 (2): 299–309. doi:10.1007/s00436-009-1679-3. PMID 19921257. ^ Jaggy, André; Oliver, John E.; Ferguson, Duncan C.; Mahaffey, E. A.; Glaus Jr, T. Glaus (1994). "Neurological Manifestations of Hypothyroidism: A Retrospective Study of 29 Dogs". Journal of Veterinary Internal Medicine. 8 (5): 328–36. doi:10.1111/j.1939-1676.1994.tb03245.x. PMID 7837108. 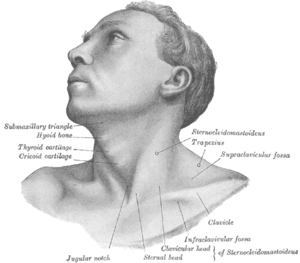 Wikimedia Commons has media related to Torticollis.